Today is my last day of employment at Avid, and this will be my final post here on the Sibelius blog. My first day of employment with Sibelius Software was Tuesday 4 May 1999, when I was an Oxford music graduate of just 22 years of age, and I was splitting my time between singing as a lay clerk at Ely Cathedral by evening and answering technical support emails, letters (yes, real actual letters! Imagine that) and phone calls by day. And, of course, answering questions on the Sibelius chat page (as it was known then) at all hours of the day and night. Some things haven’t changed in the intervening 13 years — until today, I’ve maintained my habit of answering questions on the forum at all hours of the day and night — but many other things have. 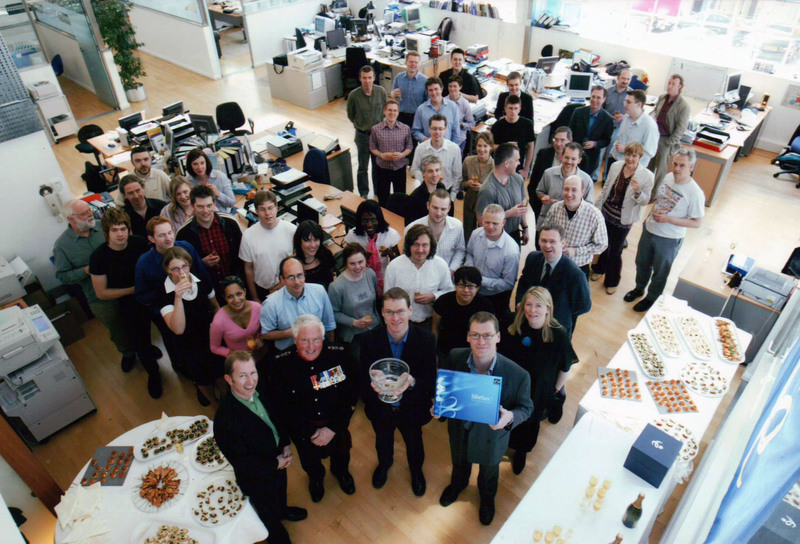 I’ve been witness to Sibelius Software growing, moving to larger premises twice within two years, opening offices in Australia and Japan, being showered with awards, being acquired by Avid, surviving the trials and tribulations of the fortunes of its parent company, and now going through certainly the largest changes in its history. I started the Sibelius blog just over four years ago, in October 2008. The Sibelius Software of old was rapidly being absorbed into Avid, and staff were laid off as the company struggled to streamline its operations. With fewer people dedicated to Sibelius inside Avid, I decided to set up the blog and run it in my spare time, with the aim that the stories about the amazing things that Sibelius users were doing with the software could continue to be shared with the world, and to provide tips and tutorials for using the program. Over the intervening four years, I’ve written nearly 450 posts on a wide variety of topics. I’ve heard and shared some wonderful stories, and regular readers have hopefully learned something along the way. Now that I am leaving Avid, I am handing the reins for the Sibelius blog over to Philip Rothman. Philip is an expert Sibelius user based in New York City, and in addition to being a professional composer, orchestrator and copyist, which you can learn about through his business web site, he has also run a number of acclaimed training sessions on Sibelius. Philip has committed to me that he will continue to run the blog in the same spirit in which I first began it, and I am very grateful to him. I hope you will stick around and enjoy the great stories and tutorials I know he will share here in the weeks and months to come. Of course, there is also a new official Sibelius blog on the Avid web site, which will feature guest posts from other prominent Sibelius bloggers as well as posts direct from the mothership, so you can check that out, too. Thirteen and a half years after I started at Sibelius Software, I am a few days from my 36th birthday, and it’s finally time to say goodbye. 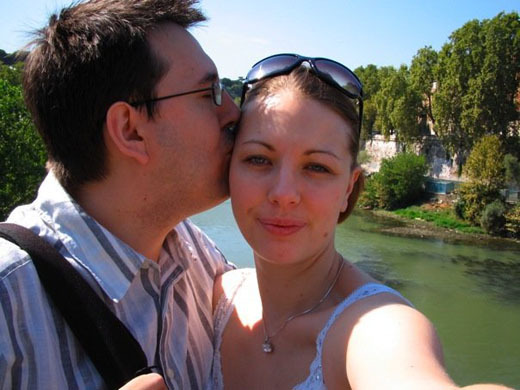 Me and my bride, walking by the Tiber in Rome on our honeymoon, four years ago. Although I am sad to be leaving this part of my life behind, I will be carrying so much of it forwards with me. I met my beautiful wife Sarah through Sibelius, and together we now have two amazing children, Amelia and Ayrton. I have made many great friends, and there is a strong bond between the people who were a part of Sibelius Software that abides even now. I have travelled to a number of countries and met countless talented and interesting people, including several of my musical heroes. It has been quite a ride — filled with ups and downs, of course — and there are few things I would change. It has been my privilege to be the steward of the software born more than 25 years ago of Ben and Jonathan Finn’s unique genius, and I have always tried to embody the spirit of their creation in each feature and version I have designed, in collaboration with the most remarkably talented team of programmers and testers you could ever hope to find. Now it’s the turn of a new team within Avid to take Sibelius forwards, and to do their best to serve the needs of musicians all over the world as I and my colleagues have done for all these years. I wish them luck. To everybody who has expressed support and concern for me and for my colleagues over the past few months, thank you. It really has meant a lot to us. If you would like to stay in touch with me, I’m easily found on Twitter, Facebook and LinkedIn. Until we meet again, so long. Thank you for all the oustanding work you performed along those years. Your name can’t be forgotten for sure. Best of luck for your next step. Daniel, thank you so much for all the wonderful und gentle support! Thank you for everything, Daniel. You and the Sibelius team are still the most responsive & helpful customer service team I’ve ever spoken to, and Sibelius remains my favorite piece of software, and I literally cannot imagine my life without it. Good luck with everything. You’re a good guy, and this was a gracious and classy farewell. May all go well with you. Cheers, Daniel, and great happiness for all your future ventures. Leaving us on All Hallows Eve eh? – and just as I start to attempt activating my Sib7 upgrade- all very scary!Many thanks for all your help (and patience! )Wishing you and your family the very best of everything for the future. you really are what made Sibelius, so good, and so special. Many thanks for the software and all the helpful advice, Daniel. Wish you all the best! Thanks for the past few years Daniel and all the very best for the future. Thanks for everything you taught me Daniel, I am forever in your debt. You enhanced a knowledge I had that helped me – help others. Thanks for everything Daniel, you will certainly not be forgotten. Godspeed to everything you do. And welcome to Philip, looking forward to your posts. Thank you Daniel. I wish you every success in your future endeavors. I still hope to meet you someday. You are one big lesson in class and perfect professionalism. You will be sadly missed. Outstanding work. I wish you all the best for your future. May it be a bright one. Thank you, Daniel, for everything you did for Sibelius. I wish you only the best for what is certain to be a bright future. Thank you for your outstanding work Daniel. I wish you and your family all the best in the future. To you and all the rest of the incredible team that has built and maintained Sibelius over the years, thank you. Your work has given me my primary vehicle for the rediscovery of my muse, and for this, I will be always in your debt. All the best, Daniel! We expect continued great work, wherever you next surface. Hope to hear from you again soon! Thanks for all your support Daniel. We, in India got the best support from you which helped to change the way musicians here work with notation. Most of them even learned music notation to use Sibelius! Wish you all the best for whatever you are going to do next. Thanks for your help over the years that was always freely given when asked for. A sad day to know you’ll no longer be the very personal face of Sibelius. Thank you Daniel!!! You have been a tremendous help to all of us when we needed it. You exhibit the personification of class in the face of Avid’s huge mistake. So I guess this day has finally come. It is a sad day for all of us who have grown up with Sibelius. I’ve been using it from the very beginning and have had every version. It was fantastic to watch it grow and bloom. But now the gardener is leaving. So Daniel, for everything that you have done for all of us over the years, many thanks. You have a lovely family and I know they will keep you busy. All the best to you. Sorry that this had to end this way, but the world of greed and money seems unstoppable. the Concert Zither( not a common instrument)..
SIBELIUS FOR SENIORS WHO ARE GAME TO TRY IT! GREAT! Daniel, I am awash with emotions that seem to be going off in all directions at once. I thank you for your patience, devotion, helpfulness, unbelievable knowledge and for being an all around good fellow. Best of luck, no much more than that, for your future and the future of your family. You will always have a special place in my thoughts and prayers. Thanks for all you years of excellence. All the best in your new adventures. I hope only the best for you and your lovely family. It must have been a sad moment taking and posting that photo of an empty office. It’s a symbol of what has happened to Sibelius in the last few months. But nobody better deserves happiness and success than you do, and I wish you both in full measure in whatever comes next in your life. Thanks a lot for your super service. I hope for the future of Sibelius. The new team surely have a high standard to live up to. Thanks so much for your allways efficient support. Whis you all the best! Thank you, again, and all the best in your future career. I remember your starting at Sibelius and, as you have often reminded me, having to put your own desk together as your first task! I look back on my days at Sibelius with great fondness and I still miss everyone! Good luck in all you do. Sibelius has meant a lot for my advances in piano jazz. I want to join all those who wish you luck, and please keep in touch with us on Facebook (friends). Many thanks for all your work during all these years. I will miss you. My best wishes for you in your next work. Greetings from Madrid. Many thanks for having been there, Daniel, day and night indeed… I really appreciated that. All the luck in the afterlife for you and your dearly beloved! Daniel, you were invaluably supportive to me early on (been out of circulation for some years – hope to resume soon). My ongoing best wishes go to you and your family! Many thanks for all the work, help and advice – I have learnt so much from Daniel and the rest of the team over the last 10 years. In fact your leaving will leave a huge vacuum in Sibelius. It’s a sad news, and You were there from the pioneer times; in the times of the brothers Finn. It seems not very clear what are the real reasons of your departures, but when I looked at the picture with the empty (relocated, yes..) Sibelius offices.. I already felt, many months ago that Sibelius was not what it has been. The 7 is troublesome indeed, and still. Despite all the great new features, it was not all that for the better for a classical composer. I WISH YOU A GREAT SUCCESS IN YOUR CAREER. You are at the crossroads of your life (once I was also 36..) and you have a great asset from Sibelius: your wife, I think. I hope to hear some creativity (music or new projects) some day of you, better sooner than later, because, Daniel, life goes by VERY quickly.. God bless You and your family! As an amateur I was a reader rather than a contributer to your marvellous messages on the Sibelius site. I thank you for the many times Iread something I could so badly use. Also for the help you gave me with the introduction af Sibelius 7 and my upgrade. I’ll miss you. Have a good time and Good Luck. Thank you very much, Daniel, for your enthusiastic and interesting writing all these years. You seem to represent the truly liberated individual who goes above and beyond the constructs which limit our potential. I wish you the best in your future endeavors. Daniel, I am sincerely grateful to you for all you have done formes over the years. I have written several of my most successful works, both large and small using Sibelius 6 and have always found you an indispensable part of that component. For that all I can say is THANK YOU. I also pray that the new company will continue the wonderful work you started. Best wishes to you, Daniel. You know how to make Sibelius a part of a musicians world. You will be missed! All the best, Daniel, and thanks for all your help over the past years. This is a very sad day for all Sibelius users. Wishing you the best of luck in your future endeavors. Sad days, Daniel. Thank you for all your efforts – your replies to my not infrequent silly questions were always treated well. I trust Sibelius will not die a death, as has been conjectured in the UK media. Many thanks for all your help over the years. Good luck and best wishes. Goodbye Daniel, I’ll miss your posts. I have always been an ‘avid’ reader when I found the Sibelius blog in my postbox; there was always something interesting to read. So sorry you are stopping. I hope your successor will do as well. All the best for the future, for you and your family! What a crime this is. I will miss you. What a pity. I only just ‘met’ you and now you are going. Thanks for the invaluable help you gave me when I first started with Sib 7, I have not forgotten your kindness. All the best with your future ventures.